Fully revised, the 2009 NFPA 54: National Fuel Gas Code Spanish facilitates safer installations and better protection against fire and explosion hazards. 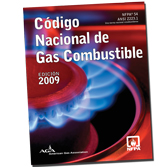 Up-to-date with current techniques, products, materials, and construction practices, the 2009 National Fuel Gas Code Spanish provides a more effective means of ensuring fuel gas safety on consumers' premises. Based on scores of proposals from Code users like you, it presents designers, installers, AHJs, maintainers, and inspectors of fuel gas systems in buildings with state-of-the-art criteria for the installation and operation of gas piping systems, appliances, equipment, and related accessories. New bonding requirement for corrugated stainless steel tubing (CSST) gas piping installed inside buildings protects against threats likely to energize gas piping. Revised requirements for connectors to radiant tube heaters prevent cracks, leaks, or fractures. Additional requirements for commercial cooking appliance connectors will reduce the risk of fugitive gas, potential fires, and subsequent losses. Revised requirements for sidewall vent termination ensure reliability and prevent nuisance shutoffs. New requirements that all heating boilers have a low water cutoff switch to prevent boiler failure.